Happy Valentine’s Day. HBO has announced the third season of Last Week Tonight with John Oliver premieres on February 14th. The series will once again offer an in-depth and satirical take on current events. HBO has already renewed the news program for a fourth series, which is set to debut in 2017. Presenting a satirical look at the week in news, politics and current events, as well as addressing broader issues, LAST WEEK TONIGHT WITH JOHN OLIVER kicks off its third season SUNDAY, FEB. 14 (11:00-11:30 p.m. ET/PT), exclusively on HBO. LAST WEEK TONIGHT WITH JOHN OLIVER is the only weekly news-oriented comedy series to be presented on Sunday night. Taped in New York a few hours before it debuts on HBO, the show features a mix of Oliver’s topical commentary, pre-taped pieces and occasional guests. LAST WEEK TONIGHT WITH JOHN OLIVER is also available on HBO NOW, HBO GO and HBO On Demand. The show received an Emmy(R) in the category of Outstanding Interactive Program, and was nominated for four Primetime Emmys(R) overall last year, including Outstanding Variety Talk Series and Outstanding Writing for a Variety Series. The show was just honored at the 21st Critics Choice Awards in the category of Best Talk Show, and previously received a Peabody Award, as well as Writers Guild Award in the category of Comedy/Variety (Including Talk) – Series. LAST WEEK TONIGHT WITH JOHN OLIVER continued to garner widespread critical acclaim in its second season. 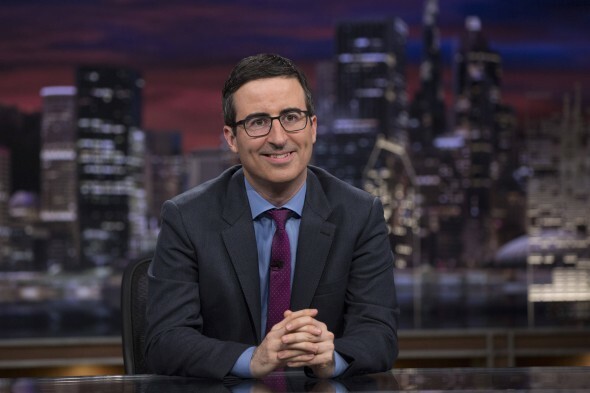 The Financial Times hailed Oliver as “American television’s satirist-in-chief,” while Vulture called him “the most important person in television.” The New Yorker observed, “Oliver is a master of tone and timing,” adding, “for clarity of expression and comedic effectiveness, John Oliver’s show may be the best and purest show on television.” In addition, it was named to numerous “best of” lists for 2014, including Rolling Stone, the Huffington Post, the Hollywood Reporter and Indiewire, and was recognized by Sports Illustrated in its Year in Sports Media feature. What do you think? Do you watch Last Week Tonight with John Oliver? Will you tune in for the season three premiere? More about: HBO TV shows: canceled or renewed?, Last Week Tonight with John Oliver, Last Week Tonight with John Oliver: canceled or renewed?